High fees with no explanation, then they get higher as you go through your transaction..! Makes buying tickets simple and easy. 51+ minutes on the phone with these idiots! Don’t buy or sell here!!! You hav been warned! I have used stubhub for years. A few weeks ago they would not cooperate with the 49ers/Ticketmaster. I spent over an error on this on multiple occasions and ultimately, I paid a penalty. Eagles for Super Bowl Repeaters !! Signing in takes 5 to 8 times before before it finally lets me in my account. App keeps kicking me out after login. My credit card’s informations were totally current, but the system told me there was a problem while processing in your request, please try agin. Then I just tried thousands of time, and it did not work!!! What can I do? There was no way to print out our tickets in advance and the app kept crashing when we were outside the stadium. It is took us approximately 50 attempts before we were able to get in and take a screen shot of the tickets. As I a seller you really get the short end of the stick. You have to jump through all of these hoops to the tickets to the buyer. The quickest way to send it is through PDF or mobile exchange. However, then you have to wait 5 days to get your money!!! My tickets left my possession day 1, yet I wait 4 more days to get my money. That is ridiculous!!! I miss how the “Favorites” I selected under “Events” use to be in order of dates of the events. The app doesn’t work with IOS 12 and have tickets I need for tonight. It keeps asking me to log in or will not let me view my tickets. Update your software. It is made super hard to sell a ticket on this site. Very poor instructions and they waste your time on a process that is so much more easy on other sites. I will never sell anything on this site again. The app would not load my tickets after almost 2 hours and the marketing email they sent me claimed I didn’t have tickets... so I follow the instructions they sent me and buy the tickets again... still nothing. After calling support they instruct me to refresh my app and now I have 2 tickets... which I don’t need. They refuse to refund, or give me a manager or a callback. After calling again the notes on their file do not ask for one and simply state that I bought two tickets... They refuse to admit the email was misleading or the app was working improperly or that the customer service call was miss stated. Horrible experience, this company only cares about financial transactions and keeping as much of your money as possible. Using StubHub was easy. I got good tickets at a good price. The $15 per ticket charge I think is excessive. I purchased 5 tickets to MNF Bucs vs Steelers for 9/24/18. Each ticket cost $350 for good seats in the second tier: Section238 Row E. Still pricey but it’s MNF. Stubhub gives the price for the ticket and states plus fees. However, the amount isn’t given. i paid for the 5 tickets then was given a total. i was totally shocked at the total given. once i did the math, I was charged $85 in fees for EACH TICKET!! You read correctly, $85 in fees for each ticket. what are the fees? I HAVE NO IDEA because it doesn’t say. I’m guessing, taxes, and whatever service fee on top of it. It would have been professional to notify the customer ahead of time what the total amount in fees were. This way I will have the opportunity to decide whether I want to purchase the chosen tickets or buy cheaper ones. I’m guessing if they notify me, i will decide not to buy any tickets or buy chose cheaper ones. Of course since I paid for them, I can not easily return them. I would need to sell them. People, be careful of the fees!!! next time I will go to TicketMaster. They are cheaper. My ending up at Stub Hub is another story for another day. But if you must use Stub hub, find your seats then call their 866 number and ask for the total amount the tickets will costs. you will be able to figure out the fees. $85 in fees per ticket is ridiculous!!! I will also be sending a written complaint to the corporate office. The app is robust and the view for the seats is awesome but paying roughly 30% fee stinks! It should be illegal to charge this much for fees. They get these fees from the buyer and the seller. StubHub is a crooked business. After buying tickets over 1k false charges to my credit card. This was a brand new card and StubHub was the first charge I ever put on it so I know the credit card fraud was a result of purchasing tickets through StubHub. Enjoying this seat photo view feature. If my tickets are real for tonight I’ll be extremely happy with my app experience! Today was my first time ever buying a concert ticket from Stub-hub. Was a bit Leary at first then took a chance. Awesome service! My ticket came through with no issues!! And i attended my First BTS concert ever! Thank you Stub-hub! Will be using you again for any future concert tickets!! Thank you! Asked for direct deposit and they PayPal payment. Had will call tickets- they don’t honor them. Will not use again. The worst experience buying tickets. Tried purchasing through the web browser and app...only to be prompted several times to reset my password, after doing so still did not work. Had to call into the 1-800 number, very slow service with 45 min wait. Once on the line was told that my card was locked (for what reason??!!) and couldn’t use it. And the tickets I was wanting had just sold to someone else. Terrible experience and hope I never have to purchase tickets through here again. Good app and easy to use but I wish they would just add the fees into the ticket price from the beginning! Horrible help center. Online help so bad!!! Stubhub is absolutely garbage. They have poor customer service and don’t honor their agreements. Over $30 a ticket so that I can download is nuts! Since we live in a scalper-driven time Stub Hub and sites like these are a necessity but I don’t understand the need for these ridiculous per ticket fees. No idea what their business model is but I didn’t get my tickets and customer service always disconnected in the middle of me trying to get a refund. Thank God I used Paypal and a credit card to protect my purchase. I don’t understand why StubHub won’t allow you to update your billing address. It’s ridiculous to assume that StubHub has the audacity to think they know better than their customer what their billing address is. I can’t purchase something until I verify my billing address and it’s making me incredibly frustrated and considering to use a different ticketing service. Companies should not treat anybody like this. I tried numerous times to buy my tickets with my ApplePay and it kept saying it was setup incorrectly despite the fact that I had just bought DoorDash with it five minutes before. One single ticket was listed at $27.60 for over 7 hours today. I attempted to purchase said ticket for 3+ hours and received an error message. I called customer support to report the anomaly and they promised orally (after I attempted to purchase said ticket with them over the phone and was told they also received the same error) that it would be removed. 6 hours later the ticket was still listed. I am familiar with this strategy. It is done in an effort to drive clicks and web traffic so that they can list a “starting at” price very low relative to average ticket price. In reality the delta between that ticket ($27.60) and next cheapest was $50+. Its a smart strategy, but not legal. The better business bureau (BBB) will not stand for this sort of diversionary tactic. Please do not continue to deceive StubHub patrons; your customers do not appreciate being deceived at the behest of web traffic statistics. I just wanted to take my son to his first Gopher football game. The ticket fee was $8.32/ticket, but the ticket was only $23 before the fee, $31.32 with the fee included. Vultures! Too bad they charge soo much in fees and then show ticket prices without. Back in the day they were more honest and didn't jack the price up at the end, the price included fees, but in their new bait and switch they now don't ad fees and you cant even keep the ‘price with fees’ on as a default setting. Really it’s a joke — the price WITH FEES is THE price. Easy to use super exited about our tickets! 23 dollar fee for one ticket is robbery. These fees are ridiculous.....1/3 of the ticket price. When you can’t go , StubHub is a great option to get value for tickets to events that others want to attend..
Would not know what do to without Stubhub. We love concerts and great seats. Great to buy and great to sell!!! This is the easiest and quickest app to search for sports tickets. Love it. Minimal navigation and instant transaction. Excellent venue seat depiction so you’ll know what you’re orientation to the surface/stage will look like. I bought tickets that were sold twice. Be careful, i will not use Stub Hub again. I bought tickets for a lame preseason NFL game, and the day before the game was informed that the seller decided to “re sell” 2 of my 6 tickets. Then stub hub calls me acting like they have good news for me. “We are gonna upgrade 2 of your tickets sir!” ... they gave me 2 tickets that were 3 rows up from the old ones! What an upgrade! Lol jk so now I’m going to this game with my family tomorrow night... me and my son have to sit 3 rows away from the rest of my family. Awesome. And I paid for my tickets the day they went on sale. I used to be able to use flashseats for Texas A&M tickets, but they seemed to have switched to Stubhub as their official ticket sight. WAY more difficult. Used to be able to transfer tickets for free to friends...I tried with Stubhub and it appears as though I can no longer do that. I looked into buying and selling tickets, and see that Stubhub charges EACH party for the transaction...flashseats never did that. They wouldn’t charge the seller, just the buyer. Just makes me feel like it’s a money-making scam, and I am quite chapped A&M switched providers. Wish they’d include in fees into the price. They list one price but you pay a higher price after fees are added. Otherwise great app. Very nice app - thanks! While easy to purchase, the 20% fees they charge you are such BS. This is in addition to the charge they place on the seller. Since this is owned by Live Nation, who owns everyone else including Ticketmaster, it’s the consumer who gets hurt with these excessive charges. It’s almost like a pay day lender model but for entertainment and should be regulated. At checkout it clearly shows 2 tickets at $95 each and total fees $31 but somehow my total is $254. Why do you not list the other $30 you are charging? Makes buying tickets a breeze. Thanks Stubhub! so in order to list your ticket you MUST have a valid credit/debit card and NOT a prepaid card. i entered my debit card and tried to list my ticket then i got an email saying they locked my account and deactivated my listing. so i contacted customer service and had to do so 4 times until everything was situated. customer service was okay but i just wish i didn’t have a hard time with anything. I love this app, but it glitches and several times had me going back, re-enter info, only to tell me that The tickets were no longer available. They were, but it was “stuck” in the system and I needed to wait about 10 minutes to buy those tic again. I don’t think Stubhub has added any new features to their site or app in 5 years. Clunky! StubHub’s buying fees are Frustrating and Outrageous!!! I was not permitted to change my ZIP Code on the billing address for the credit card. I just want my tickets. Overcharging for fees and then spamming me with offers is ridiculous. I hate their “Don’t forget your (insert whatever tickets you happened to be browsing)” notification pop ups and emails. There seems to be no way to control what notifications you do and don’t receive. I wanna be notified tickets I have for sale have sold and that’s it. I was so excited that I could buy a ticket to see Hamilton the next night while visiting Cleveland. When I got to the theater, I was shocked that the show had already started. After the show, I checked and Stub hub had given me the wrong time for the show in at least three different places (email, text, etc. ) Three people next to me arrived late too! Although Stub Hub claims to “guarantee” their tickets “100%”, it was really hard to find a telephone number to call them about this problem. I spent hours on the phone and was offered a lot of apologies and a credit for the fees that I had paid to be used on my next order. After a lot of back and forth and asking to speak to this manager and that manager, they agreed to give me a cash refund for half of the ticket price. I’m not sure if they really did or not. It was so annoying that It took hours of work to get a partial refund. They should have offered it right away or agreed to give me a credit so I could see the part that I missed! I would not use this service again! Ticket fees not disclosed until checkout and can be a huge percentage of the total spent! These fees are in addition to what they charge the seller. Buyer beware! Service fees are ridiculous. I almost paid as much in service fees as I did for my tickets. Fees shown only at final purchase step. The $15 per ticket fee was not shown until the final purchase-click step. So far so good. Never used this app before so hoping everything goes smooth. 4 hour drive to game tomorrow. Easy app but I don’t like the added fees at the end. They need to include in price rather than have service charges tacked on! So easy to find and buy tickets! “Mobile” ticket - you can print them at ballparks Will-Call window - so obviously the e-ticket exists - but there’s no way to print them at home. If you don’t have cell phone w app - plan on waiting in line at stadium, even if you purchase their “Instant” ticket. Call customer support - where message says average wait is 6 minutes - pure fiction. Ticketmaster much easier to deal with. Not the end of the world.....live and learn I guess cuz I won’t do this again! Stop charging such high fees and maybe give discounts once in a while. Trying to get help is impossible! I used to love the convenience and security of Stub Hub. But, lately, I’m getting sticker shock every time I click “Purchase”. The fees are way, way, too high. I’m going back to scalping tix at the venues. I am not very savvy with technology today being a senior citizen. However, the Stubhub app is very user friendly and the graphics of the view from a seat helps in your purchase. Nice work. I used the app to buy tickets to a football game. When I went to get my tickets on the date they were supposed to be available the customer service guy spent 20 minutes on the phone with me helping me. I had to received an email a week later saying the vendor selling the tickets no longer had them. The new customer service rep worked with me to get new ones at no additional charge. They even offered me a full refund if I wanted it. I would recommend these folks. Stub hub is not user friendly. OSU vs West Point last year and i got my tickets on time and this time I got good seats better than last year! Stupid I have to use this app just to get my tickets vs printing them. Had to delete app/photos from my phone to clear space for this app only to delete the app after my event. If I had known I would have bought through a competitors site. Downloaded the app because I had a couple concerts I couldn’t attend anymore. I saw my tickets were selling for 30-60% more than face value. I’m not interested in turning a profit so in good faith I listed them at retail price. Immediately after listing the first one I noticed an error and deactivated the listing. I was at the deactivation screen and noticed an error message. I should say that this app has terrible UX/UI, it wouldn’t let me populate the ticket details without partially or fully covering part of my screen (iPhone x) I notice that in sales I have 1 sold ticket but make nothing of it because I thought it was from the deactivated ticked. So I listed the ticket again and 30 minutes passed by and I got a notification saying congratulations your ticket sold. I take a look at my sold section on the app and notice that the first ticket had not cleared yet so I decide to call customer support. I speak with a representative which I won’t name here. She tells me unfortunately I would be charged 40% of the tickets value or the difference for another ticket which ever is greater. I tell her, well my ticket was retail and fair value, she tells me well why would you low ball?! I tell her it’s face value and fair price and plus the price is labeled on the ticket. She tells me “buy more tickets” I tell her “mine is the cheapest one” Is Stubhub running some type of securities fraud? I mention I might get my bank involved because their policy is not clearly stated and like I said they have terrible UX. She immediately threatened me with collections agency and telling me that for sure “your bank will concede to us and see it was the sellers fault” I’m not sure what to do now. Me in good faith listed a ticket almost half the price of the lowest listed and get punished for it? Why are we as sellers the insurance fund? Without us you’d have no tickets. You’re going to guarantee a ticket but that guarantee comes from the sellers and in my case it is forced. I was threatened over the phone. I can’t believe I’m filing an SEC and BBB report on this company. I purchased tickets for an NFL preseason game only to find that at the gate someone else had already used my second ticket to get in. Not a happy customer! Bought tickets for a Blue Jays game in Toronto and prices weren’t indicated as United States Dollars until I got my credit card bill. Way more expensive than I wanted to pay! Once they have your money they will make you fight for a refund. Had to go to my bank to get refund. Fortunately I had there promise of a refund in writing. Horrible company. Fees are way too high. 10% on seller side and up to 25% on buyer side. It didn’t used to be like this. The app often loses connection during the checkout. Hangs and hangs. If you quit, and try to purchase the tickets again (because it seems as though it didn’t work the first time) you get an error. I check the My Tickets tab, and it now says I bought the tickets, but now I can’t view them to confirm, because the app hung again. Only after 10-15 minutes do I get confirmation by email, but my card isn’t charge for another 20 minutes... Stubhub has a better UI (user interface), but TicketMaster’s app simply works better. So long, Numb-nub! It kept telling me my credit card was connected to a different account which is impossible because I am the only cardholder. I spent about 3 hours trying to make it work and then my purchase was after midnight so I didn’t get my 10% off. Not very happy right now. Not a fan of the Fee not be added before you get to check out. The app didn’t let me designate a payment when selling my tickets, I had to use Safari. iPhone 8. I found a great deal on Red Sox tickets. The app would not let me use a credit card that it had on file and that I had used before. So I tried another credit card and then another. Neither of those worked. Then I called customer service. But by then the tickets were gone. Should have option to include fees in prices up front, since they are so high!!! App work alright until I had to look for the fees, the fees when they are greater that 30% of the cost of the ticket should be added to the price of the ticket up front, or at least make it an option on the app. In summary your fees are excessive and That is why I use alternative. Bought 4 tix and got 3. Why would I use your service again? So expensive! They’ve really got you. But if you need the tickets, they do come through! I ended up needing to log in to the website to make changes so that I could complete my order. Had to flip back and forth a dozen times, risking losing the tickets I wanted. Not very intuitive or user friendly app. Best way to buy tickets!!! I had to check multiple times to apply estimated fees. Sometimes it works. Sometimes it doesn’t. It’s very deceiving. Shame on stubhub. It used to be a reputable company. Fees are ridiculous. Stubhub also fails to reesonably disclose and explain such high fees. More than 20% to buyer and they charge the seller a fee too. Easy to find games. Great app giving good idea of the view of the field from selected seats. Like the suggested better seat selection function. When I apply a filter the ticket map no longer works. Why is this important? Because you won’t be able to see the tickets you purchased if you don’t! Just discovered this the hard way. Older version of app said my tickets were delivered, searched all over the app for them and found nothing. On the verge of panic and then checked the app in the App Store and it showed a need to update. Once I did that, the tickets became visible in the app. Come on product team and developers, these notifications are critical to cut down on customer support issues, bad experience and bad reviews. Don’t really like the processing fee for each ticket. I’ve used it for many years. The fees are getting quite high. Easy and nice to use ! When you need to enter info to sell tickets, the keyboard blocks the area you need to fill in. It’s like a child designed this. It also does not recognize the seat section that we’ve had for over 10 years. Step backwards, Fire the design team. Fees are outrageous. 28% is just way too much. Pearl Jam tickets with a view of a pole! Stubhub fees are getting higher and higher - basically a 25% increase in the amount you pay. Process is easy and filters are great but I just paid 2x 19.50 for tickets that were 66.50 each which amounts to about 30%! Ridiculous. Service charges are much to high. The idea of having to buy resold tickets doubled in price with a service charge that sold out in 2 minutes is ridiculous. Fees are pretty crazy priced I feel, but good ticket selections. I bought 4 Colorado Rockies tickets recently, and learned that they were only electronic now. I don’t normally carry a smartphone when I go to the ballpark. My niece figured out how to bring them up on her phone, but it took forever for the stadium guy to scan them. Slower than for hard tickets. And all four of us had to be there at the same time; we could not arrive separately like we usually do. Then, the usher at the top of each row demanded to see our ticket every time we returned from a food or bathroom trip. I did not have the ticket- my niece did! What a hassle. I will certainly not buy any more tickets from Stubhub under this electronic- only policy. They are much more inconvenient and slow than simple hard or printed tickets. Would love to actually evaluate this app properly—but that’s impossible when it doesn’t even allow you to log in. The exact same user name and password that work on the website just fine never work on the app. Rebooting doesn’t work, resetting password doesn’t work, reloading the app doesn’t work. A complete bust. All of the sudden when I select criteria for a show or concert, the bulk of the screen shows my selection options but very difficult to see ticket choices based on those options. Almost as if you designed only for Apple plus screen and not SE. This just changed recently. Annoying. Can’t add tix to Apple Wallet. Customer support said it doesn’t work but it’s not a bug. Ok then. Stub hub is an excellent source for tickets, but they charge a lot for it! Your fees are absolutely ridiculous. It should not be a percentage based system it should be a flat fee. You inflate ticket prices and the initial cost of the ticket is completely misleading. At least show the true price of the ticket on the initial page instead of misleading everyone and not showing the true price until the very end. I will not use your site again until this is fixed. Price shown was with fees, when I checked out price was more that shown the screen before? Why? Ripped off again you guys are scammers. They’re Evil Pirates stealing money from fans. They’re Evil Pirates stealing money from fans. They charge sellers And buyers? I used the estimated fees feature to get what I thought would be a realistic estimate of total price. For a $56 list price estimated fees were $10 less that actual fees. A feature that should save time has no value if you have to go to checkout every time you want the correct price. Why doesn’t the estimated price feature utilize the same data the checkout price uses? Poor design that leaves a bad impression. Stubhub has been a difficult site to work with for years. The latest “upgrades” don’t improve more than the look of it. The two stars are for the fact that there are always options. Selecting them and paying for them is still unwieldy at best. Despite what stubhub claims on their website you cannot transfer tickets from Ticketmaster. And despite what their customer service reps tell you, they won’t share email addresses of purchasers so you can share them yourself. Instead, they will just cancel your sale an hour before the event so you list the funds you were supposed to get and then can’t sell your tickets anywhere else. Don’t use stubhub. They can’t be trusted. Could not scan barcode using IPhone....had to call customer service. Fees more than $30/ ticket-are you kidding me? Stubhub’s app for concert tickets is easy to use but the 25% service fee seems exorbitant. Other resellers aren’t any better, though. Best thing to do is be aware of who’s coming to your area ahead of time so you can buy tickets on the original. Or go through Craigslist and hope the tickets aren’t bogus. App works fine for locating and buying tickets which is primary reason for using the app. 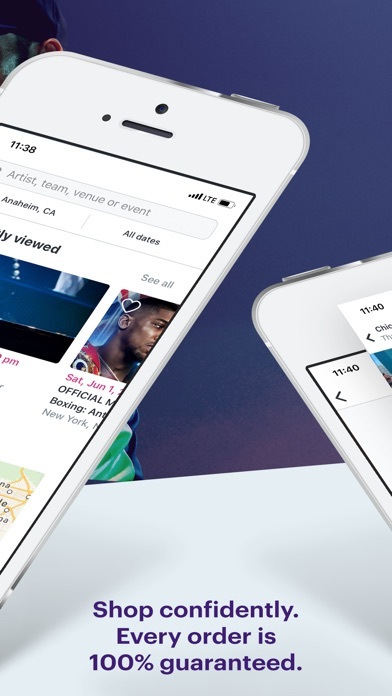 It would be much handier if it would allow you to send your tickets to your apple wallet in case of slow wireless speeds at the gate of the event. This is a basic ticket app feature at this point. It’s simple, easy and I can go about my business after spending just a few minutes on this app. Service fees are Extreme!! Out of control!! Love how the tickets I bought on my laptop automatically appear on mobile! Horrible service that I will never use again. Very disappointing. I attend concerts/sporting events weekly for professional and personal reasons and use several ticket purchasing apps yet Stubhub is my last resort app. There are two main reasons why which have NEVER been updated or improved over the years: 1) unlike other ticket apps, Stubhub still will not display total prices (including all fees) until the final checkout. This is a very deceiving and time wasting exercise. And frankly, leaves the impression that Stubhub is sneaky and untrustworthy. At this point I do not trust Stubhub. 2) the interface is horrible, especially for a small screen such an iPhone (even a Plus size device). The design of the venue layout looks like a leftover from the 1998 web, being a very unfriendly format also requiring many unnecessary clicks. 3) and when compared to other ticket buying app, STUBHUB IS ALWAYS MORE EXPENSIVE for the same or comparable seats. I always feel ripped off when even just browsing for tickets. I’m only one person, but I only use Stubhub as a very last resort. I recently bought tickets for a game that had club access. When I got to the game the tickets did not have the access as advertised. When I asked for a partial refund they said there was nothing they could do. This was ~$100 of value falsely advertised and they did nothing about it. I do not like not having the option to print my ticket. $40 fee per ticket?!?!?! Pfft!! I’m an NFL PSL owner and sell season tix on stubhub every year. The app redesign is TERRIBLE. I can no longer list tix effectively on the app. It won’t let me select specs such as VIP entry, parking pass included, home side, etc. Also, it now has you input a bar code # and that somehow constitutes as instant download when everyone knows you can’t download PDF versions of tickets until days before kick off. The app also won’t let me put a stipulation on my tix selling in singles. Who wants to have 3 of 4 tix sell and be left with a single tix? Lastly, there is literally no ‘Contact Us’ or Start a Chat feature through the app.. hence what led me here. So disconcerting stub hub. Get it together!! I don’t understand the value Stub Hub brings when buying up all the Red Sox tickets when they would clearly sell out on their own. The only value I can see is a huge mark up that goes directly into their wallets. Guess they can “pull a Ticketmaster”, but you’re stuck with it. Needs to show fees prior to checkout. Good options with an interactive site. StubHub fees increase advertised price by 20-35%. Don’t buy what you click on without looking. They try to “sell” you instant tickets but it doesn’t really work. And stubhub tells you to ask the box office to print your ticket for you that costs $5 more. And only when you call them out to provide the ticket, alternate ticket or refund. Then they try to assist you. Stubhub is pretty much the only site I use for baseball and football games. The deals are great and very easy to scan tickets from phone at gates. 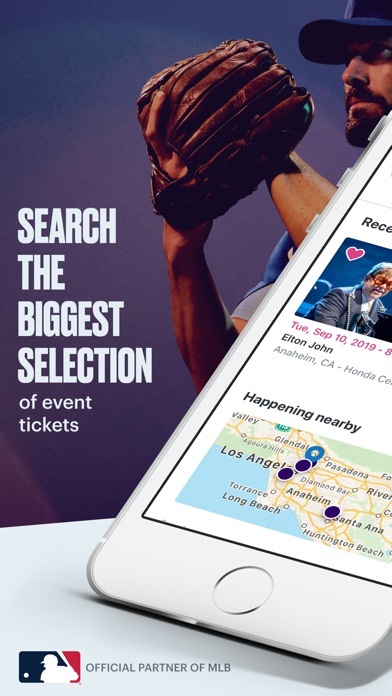 StubHub typically has the tickets available I want for certain events around town. Prices are comparable to other sites. Bought tickets to a concert a month in advance, and the day of the concert I pressed to download the tickets and turns out the seller never sent them. Called StubHub and the best the could do was refund in credits and sell new tickets for $20 more a ticket. For the lawn. Unacceptable. Never using again. App is seriously problematic. Despite multiple updates and tweaks it only gets worse. Latest version (for the last 6 months or so) doesn't allow you to save favorites so you have to manually search for the event you want every time. It shouldn't be this hard. App is good, fees are ridiculous. The new Event layout in this new version is quite difficult to use in an iPhone SE. After selecting the number of tickets I want, I can now only see one listing at a time on the screen because the seat map takes up such a large portion of the screen’s real estate. This makes it much more difficult to scroll through listings to compare seats and decide on the ones that I want to purchase. Wont accept my password. Asked me to update it and then wouldn’t accept the new password. I don’t know why because it just said “ Hmmm... something went wrong” and then locked me out of my account. So I had to set up another account. Thanks Stub Hub. Love the mobile app in buying tickets. Fast and easy to use! So convenient and easy to use and access! Stubhub is a good option for tix, and they will take care of you if there are any problems. App is good. WTH is wrong with Stub Hub app?!? OMG.... wth is going ON?! This thing is AWFUL!! Tried to change price on tickets I had listed, wouldn’t let me. Tried to deactivate, which it DID let me, then reactivate, which it WOULDN’T let me. Tried and tried and tried. Uninstalled the app and re-installed it (after “re-booting” my phone). No help. Tried to do a new listing. Wouldn’t let me. Gave up for the day. Tried the next day. No luck. Went to the website. Same freaking issues. Tried to find a work-around by posting a “similar” sale, and changed the seats... which it allowed. But then I was going to delete the old posting (which it also allowed), and then update the seat numbers to the correct numbers on the new posting, but it had deleted THAT posting, too. What...the....Hellllllllllllllllllllllllllllllllllllll?!?!?!?! Went into the menu and got “sell tickets” and it’s just circling for-EVAH. Guess what? I will be selling my Pearl Jam/Fenway tix through another venue. Stub Hub - you snooze, you LOOSE. Get your crap together! Honesty. When I try to look for Phillies tickets n try to pick a section it says there was a problem processing your request plz try again...???? Is it a bug? Should not charge service fee on every ticket. I ordered 6 tickets and paid $110 in service fees. Way too much for an order!!! Hour long mess. Technologies failure on iPhone 10. Disgusting. I bought a ticket for Jay-Z and Beyoncé, and found out, the night of the show, that the seller never transferred the ticket! I went into a full panic! Stub Hub refunded my money, but I had a very difficult time securing a ticket for a sold out show that ha already started. Stub Hub needs to account for these fraudulent sellers and plan ahead, so that this doesn’t happen to anyone else! Do not use this service to purchase tix. You will let down and lose your $$$$. On-the-go usability of this app is infuriating. Customer service amounts to, "Awww, I'm so sorry to hear that you don't like being screwed out of your hard earned money but we would be happy to do nothing about it." When the app fails to tell you that it needs to be updated and instead just says that your email and password don't match (despite resetting the password), you'll end up having to get on a mobile browser. The mobile browser experience is also awful. A new tab opens at every press and when the new tab opens you will be right where you were on the last tab. If you do finally make a purchase and realize instantly that you've just purchased the wrong seats because your fingers are too big and the words on the screen too small, so sorry; you are SOL. If you are trying to set up a way to receive money from selling your tickets, you will have to get on the browser too as you cannot use a card already saved to the app and this information cannot be added on the app. I hope you have PayPal. If not, you will need a check to enter your account and routing numbers. (I always carry a check with me.) I sincerely hope I have convinced you not to install this app. If not, good luck. So quick and easy!! We love it! How can these banking fees be so inflated? .....easy of app great but roughly 30% in fees for each ticket. I’m blown away. Total time on app was 3 minutes. Total fees $40. I’ll still have a great time. Is this company publicly traded bc they are killing it and my wallet. Ha ha ha. Pensacola Wahoo tickets - I selected 2 tickets online and when I printed them out they printed same section, same seats, but different row. At the stadium, someone else showed up with tickets on the original row I had chosen. This was a terrible mistake on the part of Stubhub. Thankfully, the employee managed the situation well, however, this should not have happened. I chose Row J and sat in Row J. The printed tickets said Row I, which the other people kindly sat in, even though their tickets said the same as mine, Row J. It makes me hesitant to purchase from Stubhub again. It took what seemed like a half hour to get through checkout. It had all my credit card data confused. I just hope I didn’t buy a dozen extra tickets! Super easy to list. Outstanding results—ALWAYS! I meant to give it to stars. But I cannot go backwards. The fees are insane. Very very high fees. Some other options are better with lower fees. Sold fraudulent tickets. Tried to call and message support to no avail. Do not do business with this company. Best Place to Buy tickets! I went shopping for tickets and bye far STUB HUB had the best value tickets!! Very please every time I have shopped with Stub Hub, I definitely recommend shopping with them. How cumbersome can it get!? I have to download their app to get the tickets I paid for. Then the app doesn’t work correctly. I had to go through another nightmare navigating their website to be put on hold for about 15 minutes. I was told they would reset my password, but 5 minutes later I was still waiting. Then I was told they could email image, but I couldn’t print it, has to be scanned off phone! What a load of crap. Remembering why I stopped using them. $70 for buying 2 tickets-crazy. $35 fee for each at $125 per ticket. As some others have said there are nice customer service people however this company is clearly structured to rip off customers. I intended to buy a parking pass and because I was less familiar with the site and the listing ended up getting a pass for the show on the following night instead of the night I was going. I immediately realized and within two minutes of purchase called and asked whether they could invalidate the transaction (well within the time that a credit card transaction could be nullified). The person refused because “policy” even though in similar situations with other vendors a mistaken transaction can be voided when money hasn’t exchanged hands. I was forced to re-list the incorrect pass (which I paid 66 dollars plus another for nearly 20 dollars in fees for) and purchase a second pass. I then was told that in addition to the fees imposed on me as a buyer, StubHub will also deduct nearly 10 dollars from the 66 dollar seller listing that I was forced to post (even though I was told by the customer service representative that they would waive those fees given the absurdity of the entire situation). I am not hopeful that the second pass will be purchased so I just paid twice for the same product and then nearly $30 in fees related to the first transaction for a $66 dollar pass and $15 in connection with the second transaction. It goes without being said that I will be taking my business elsewhere, this is so ridiculous. Makes buying tickets easy as anything. The service fees are ridiculous. Never printed my ticket, so I couldn’t get the tickets to take in but bank account still showed it had charged me. And they provided no assistance to speak with anyone or even an email address. Use seat geeks! Or anything else. Fees are ridiculous! You think you’re going to good price on tickets and then you have all these added fees. Terrible! Bad user and customer experience 37% fee on 19$ tickets. Took me a long time to get a ticket. Wanted to check out but it wanted me to sign in first then wouldn’t let me sign in. Tried to reset password, finally accessed through my Facebook. The ticket also went up in price during this time. The user experience felt like one you get ripped off on ticket prices and two they need to take your personal info as well by only letting you sign in to Facebook and oh yeah I forgot each ticket had a 35% fee. I think I will look elsewhere for tickets next time. Everything works fine until you get to the end to list tickets for sale. I ALWAYS get an error. I have tried multiple times over the past year and it always ends in an error! Stub Hub would not process my payment through my credit card, my card sent them an approval 4 times and it wouldn’t work on this site. I reluctantly had to use Apple Pay. This is my last purchase at Stub Hub!!!! And now it won’t let me make a nickname to post this review. SMH. Use Ticketmaster. Slow no apple wallet scan tickets etc. 1990s or what??? WHY CAN I NOT ADD TO MY WALLET!! THIS IS SO INCONVENIENT! Price was about $4 less on stub hub than on ticketmaster for the same section. Fees have gotten out of control. Won’t let you receive a refund if the event gets canceled or postponed, go somewhere else. 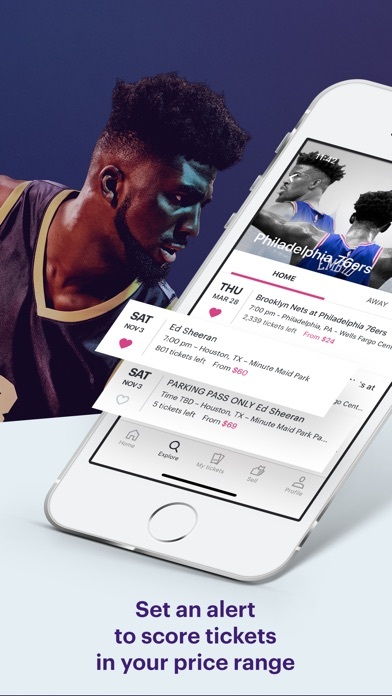 I use Stubhub because it has consistently better prices for sports & events than SeatGeek, and it is guaranteed to get you in unlike some sketchier sites. I just wish StubHub would improve their seat viewing. SeatGeek has a far superior way of looking at available seats (actual pictures from section, ability to view section with rows included). Plus, clicking on sections to select/unselect is an annoying process. StubHub is still the safest & cheapest option, I just wish they could improve the buying experience a little bit. Service and technology have been great and easy to complete a transaction. Fees appear to be escalating significantly. And due to fees increasing May use platform less. Recent purchase fees were more than cost to purchase one ticket to event. That in comparison shows fees are too much in my opinion. Got easy-to-find nice Field Box seats for Fenway against Yankees in August. Sticker-shocked by fees and then wouldn’t accept my applicable discount code, which should have been valid for 6 more days and had been used by 1,000+ people on same day. Hoping they will make it right. But other than that a good, efficient process. Buying fees fluctuate are ridiculous! StubHub buying fees range from 22% to 54%. Frustrating and Outrageous!!! Fees are ridiculous. And members rewards disappeared?!? I keep getting message saying there is a processing error try back later when I try and buy tickets. And there is no help on this StubHub error. What used to be a simple process has become a long difficult process that has caused me to nearly stop using stubhub altogether. Ticketmaster extracts their pound of flesh, and then the Stubhub fees hit ($17.50 per ticket on tix being purchased for ~$50). Remember, if you are a poor person hawking tickets outside of a venue, you are a criminal scalper. If you are Stubhub and you do it on the Internet, you are an innovative disrupter. It is a criminal enterprise, for sure. Took forever to buy the tickets on iPhone. Two tickets total 12.00 why do I end up paying 21.00? Steep prices, fees, and no discount codes for buyers. I absolutely hate Stubhub but what do you do when you need a parking pass or ticket when people buy up and double price. You pay. I was able to purchase tickets from Stubhub once before going to a baseball game, I hadn’t used the app in awhile, came back downloaded it and tried to sign in knowing that I had an account. When I signed in it tells me that “there was an error processing or completing your request” and kicked me out to the main screen. I go to sign up thinking maybe I didn’t have an account, but it tells me I did. So I clicked on forgot password, created a new one, soon as I press “create password” it tells me “hmm something went wrong, let’s try again,”. I tried to sign in and it tells me my account is locked from trying too many attempts. Ridiculously stupid and frustrating. I just used stub hub for the last time. This is more like a scam than a legitimate business. The Stubhub app is very efficient when you want to find tickets to something! Although the tickets can be expensive! Stubhub wouldn’t accept the credit card I wished to use because it alleged it was already attached to another account (unlikely). Then Apple Pay didn’t work. PayPal did, though. What a headache. Stub hub always has good seats for all the events. Spam notifications. Zero customer service. Notifications continue forever for a show you already saw. You have to block them entirely and delete the app. Also, there is zero customer service. No phone number where anyone will answer. The online form only allows like 255 characters to make an inquiry. It’s completely crazy. Bought two tickets for $25 each, charged an addition 40% ($10) on each ticket for convenience fees. Just like Evilnation and Ticketbastard, they charge a ridiculous fee to use their service. Have to always enter an additional yet identical address every time i make a purchase. Like the app but this is frustrating. Wish the prices on fees were lower and the promo codes they give you for using the app expire before you can use them again. I go to games a lot with the fam but it is expensive for a fam of 5. Wish the promo codes lasted so I could use them. Would be nice to be able to open up the tickets and see the seat numbers in addition to the section and row on the seating chart. To charge your stupid convenience fees. You’ll horrible. Last time I ever patronize these losers taking advantage of people who just want to enjoy an event. LOSERS. I purchased ticket back in May for a NFL game in September. When I purchased the ticket it said that I would get them electronically by August 21st, 2018. Since my purchase I’ve had to change my plans so I put the ticket up for sell via stub, the same place I bought them from. I listed the tickets and that same day received an email from stub hub saying that I couldn’t seek my tickets because I didn’t have the bar code numbers. I called stub hub about this and they told me I could sell tickets with the code so I ask them if they would get the code from the tickets I already purchased from them back in May. They don’t me that unfortunately the tickets I bought didn’t have the bar code enter. So I bought tickets without a bar code enter back in May but I can’t sell the same tickets I’ve already purchased and paid for because I didn’t have a bar code? What a bunch of bull. They told me that on August 21st when I get the tickets I could then sell them. Please tell me how I bought tickets without a bar code but can’t resell those same tickets until I get them. I now have to wait an entire month until I can try to resell the tickets to a game that is going to be played on September 9th. Please beware of terrible customer service and beware of buying tickets without a barcode but not being able to resell those tickets. This was my first stub hub purchase and will also be my last!!! 16 dollars per ticket surcharge. Yuck. I was able to place an order to a baseball game but tickets never showed up in the app. Customer service was not very helpful. How in the world do you charge $40 in ticket fees for two tickets. 40% in fees... deleting the app and going to the competition from now on. Complete ripoff!! There are other options and these folks are not helpful at all! How is there a 13 dollar service fee for “sending me the ticket” when I’m getting it through email that doesn’t make sense at all. I would be really happy if this app would actually do that as advertised. On spring break from Chicago and last minute rangers game. I heard that fees were going up to 13-15%. Why? Do not try to reset your password! You’ll be stuck in a loop of your phone opening the website, then the app. Round and round! Great customer service super friendly and helpful! Highly recommend! It’s like they don’t want my money ?! The app is convenient but the service fees end up being about 30% of the ticket price. I don’t want to only be able to get my tickets and admission to events via your app. I want the option of paper tickets. I will only keep the app through the event and will promptly delete it. I am also unlikely to use your site so long as I only have the app option. Worst experience ever! Never had problem like this before. Tried 3 sets of tickets and each said ticket prices have changed as i Only took less than a minute to purchase. Also quantity changed in middle of checkout. Great customer service. very helpful when i was having problems! Hard to identify seat locations. It’s a breeze to buy and sell for any venue any time! I entered multiple promo codes and all of them said expired or invalid. And all of them were from stub hub related emails that directed me to the app. So yes i bought the tickets for the sheer fact that i want to enjoy a game.... but im disappointed in what felt like a sham to just direct me towards the app. You all are the scum of the earth. Corporate scalpers. Stub Hub charges some hefty fees for sure but they get things done. Enough said. Fees are outrageous. Love the app otherwise. As a seller I hate the fact that a person chooses your tickets then stubhub tells them for only x amount more you can get these other tickets. So not right. And it seems like the amount stubhub charges seller has increased quite a bit since they got Yankees. Interact back. Fees, fees, and more fees. Charge too much food in fees. Expect your tickets to double in price. 1 step from done and, “oh, by the way, we lied, your tickets are $30 more EACH.” Crap. Learn something from airlines, hotels, and rental car companies and be upfront with the actual costs. And give me a break - $30 PER TICKET!?!? What the hell for!? I used to use stubhub to avoid Ticketmaster’s fees. Why bother? Should’ve just held a gun to my head . $33.75 service fee a ticket ? I need to start my own freaking ticket agency !! Stop sending me notifications to buy a ticket I’m not interested in. Increase the notification window PLEASE. I don’t need a notification every 20 minutes to buy a ticket. I’m absurdly close to resorting to craigslist because of this inane frequency. StubHub takes advantage of their status in the market. Good luck if you ever have a problem and need to call in. I use them because they’re the biggest name out there. I probably do about $60,000 a year but they don’t treat me any better than a casual user. Stop pushing notifications for venues or stadiums I have been to. None of which are in my favorites on my profile. There is no option to turn off marketing mobile notification and keep those I want as a seller (ie when my tickets have sold). I shut off Price Alerts for a show but I still get one every day! I can lie in my bed. 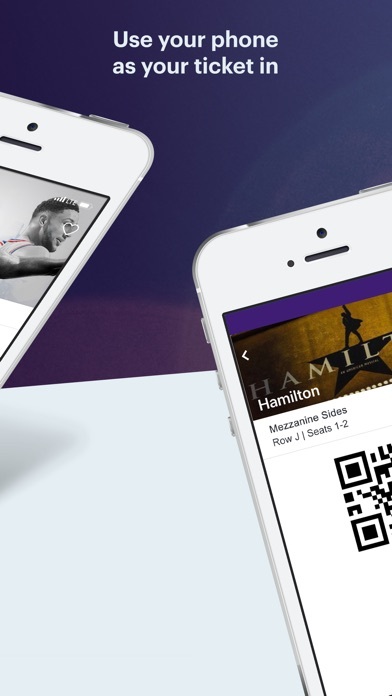 Order tickets for any event, anywhere at anytime for whatever the market-value is. That is amazing. I’ve been able to buy U2 tic’s for $12.per. $12 buck’s! Then, I opened another App, tapped on the screen a couple of times, a driver showed up at my door and drove us across town for $14 bucks. What a luxury.. truly. Love the convenience and the service fees are cheaper than buying from the mlb website! The price of the tickets are always misleading because stub hub adds nearly 30% in service fees for EACH ticket. Ridiculous. Come on tech world give us a better alternative!! I buy tickets anywhere else. Stub Hub ranks number 1 amongst our family and friends. App works fine - but adding on ~30% to costs is just insane. I hope they get wiped away soon by a cheaper alternative. Always my favorite place to buy tickets and have a good time !! Been to lot of ball games thru stub hub. Always a good value. Not sure why the prices keep changing. I would look at one set of tickets then go back to a set that I looked at the price would go up. Stubhub prides it’s self in being number one in the industry for overcharging on their fees for doing basically nothing. I would just like to see the full price up front instead if of the fees. You guys provide a great service and are competitively priced. I love that you can see what the view will Be like from your seat. I also love that you can choose best seat for you budget. Super easy to use! Jessica was very helpful. Account was locked; taken care of quickly. Buy your tickets somewhere else! It doesn’t seem like whoever makes the application for StubHub is really all that good at it. They appear to have broken the Wallet section again. There is no way to stick the tickets into your Wallet now. I suspect that StubHub may no longer want you to be able to do that. That way you can send your tickets to your friends and they don’t know anything about it. They want you to send the tickets within their own application, so they can collect the information for marketing purposes. Makes me angry. Update: Response to developer. No, in this case, major-league baseball tickets, they have been available for use with Wallet for several years now. In fact I have one currently in my wallet that came from The previous version of StubHub. This is not the first time your app developers have broken the Wallet application with StubHub or, failed to keep up with the operating system versions from Apple. Update: April 2019. Added a star as the wallet functionality is working again. I would have added another but I’m now seeing pop up ads while I’m browsing. Incredibly annoying and demonstrates the greed of stubhub. Seriously, a 26% markup fee on each ticket? Sends notifications about events on your phone without allowing you to turn off notifications for specific teams or artists. How is this allowed? Why would you send me a notification on my phone about Michael Buble? I can’t even stand his music. The bigger question is how can Apple allow an app developer to send repeated unwanted notifications to people just because StubHub wants me to see them? I could shut off notifications altogether but I sell tickets sometimes on my phone and want to keep notifications open for that. There should be a way to shut off notifications that I DO NOT WANT TO RECEIVE because I don’t go to concerts or don’t live in the city you are trying to get me to buy tickets for! I have a few small complaints! I don’t like that stubhub does not give me the option to add my digital tickets to my apple wallet. I have no problem doing this with Ticketmaster app. My second complaint is that I can not update my information from the mobile app. For example my email, address, phone number and credit card information all has to be updated on the real website. Instead of just letting me update it on the mobile app. Please fix this STUBHUB. other than those two complaints. I love the App. So easy to use and easy to set up! Thanks a lot. New pop ups advertising discounts for sports I have zero interest in are making the app miserable to use. The stupid ads are so small that more often than not when I try to minimize or close the ad, I click on it by mistake and am taken to listings I have no interest in. I know what you’re thinking... why not just hit the back button to get back to the home page? Well let me tell you... THE FREAKING BACK BUTTON DOES NOT WORK, making me force close the app to try to get back to the place I actually wanted to navigate to in the first place. And what happens when I re-open the app? That’s right, the same freaking pop up pushing a 10% discount on freaking NHL listings. Stubhub... please hire a semi-competent person to manage your UX. I was on the site looking at tickets, accidentally hit an order for $700 and can’t cancel 30 seconds later! Unbelievable! Dumpy Customer Service I’ll never ever use Stub Hub again!!! Tried to buy tickets. Went to select payment method. Selected my saved payment method. Could not move forward. Entered second payment method, then received message “payment method is associated with another account.” So I added a third payment method, and got same message. “payment method is associated with another account.” Decided to start over. Oh tickets are gone. Would have liked to have known. Ended up getting tickets at double the price. Thanks to Stubhub!!! Couldn’t disappoint the kid. Why don’t they include the fees? Or just say “ALL IN” it would be so much better if the price is up front instead, if you didn’t know your way around the app to ALWAYS have to turn the fee on in the filter! Fees in Stubhub are simply too high. It’s always been easy, and I’ve never been burned. I recommend it. Super easy and fast purchase!! The fees they tack on are ridiculous. I selected tickets and then the app Wouldn’t let me pay - then I when I restarted the app I had to pay an additional 30 dollars per ticket another $90 dollars for three tickets in 20 seconds - not happy ! Seat geeks ability to provide customer service is embarrassing. I found an okay ticket for a kind of high price and then StubHub adds an almost 33% service fee and commission. It’s almost not worth it anymore. Won’t let me use the app unless I update but don’t have IOS 12. Garbage. Impossible to navigate. Waste of time. I had tickets listed on StubHub. Sold them. Gave extra tickets, hard copy and PDF. Customer service tried to contact me and 20 minutes later they overcharged me over $300 to replace tickets that were already good tickets . I responded in less than one hour to their attempt to contact me. But they had already spent three hundred extra dollars of my money. They gave my buyer seats in a different section when my seats were front row seats. I could have resolved the scenario in less than an hour by the way. And when they charged me that extra $300. They didn't say what it was for. So I had to contact them over 2 hours to try and get a resolution. I did not talk to a manager the same day. Then they tried to call me back and left a voicemail. And claimed the issue is resolved. Because they're too cowardly to actually talk to a person who has a valid claim. Also, they cancel/close sales days before the event if hard-printed Tix, and time of start for PDF. People still looking to buy Tix at discount during event. Who does that harm? Why can't they allow people to leave hard Tix at will-call? Easy to verify with Video or acknowledgment from event management. There's no way I can recover my $300 from them, or appeal my claim. I'll guarantee you this; they'll always get theirs!! Horrible- Do Not Use Stub hub!!! I highly highly do not recommend using StubHub to buy any tickets for anything. We bought 4 tickets to a bucks game, and we had the printed receipt and tickets in hand. We arrived to the game, and someone had already used our 4 tickets!! The bucks stadium could not do anything for us, so we had to talk to Stub hub customer service in the ticket office of the stadium. They said this happens often, where the ticket seller oversells or sells the same tickets to multiple people. If this is such a problem then why don’t they fix it. The bucks did all they can do, and Stub hub customer service helped us by refunding our money. But we still didn’t get to see a game that night, due to the poor things on StubHubs hands. For this reason I do not recommend purchasing through StubHub I recommend Ticketmaster instead. Just bought 4 tickets to a concert and got charged $84 dollars in fees!! Talk about a a scam!! Won’t be buying from stub hub again!!! Seat selection was good and purchase was easy. Why do you not allow to download app from international app stores? I go on your website and buy tickets, but I can’t get the mobile tickets Because not able to download the app as an overseas user - Japan. Fees for each ticket are way too high. Prompt and reliable. Very good service. I love how simple it was I used a 200 gift card code that made me put my CC information but would not charge my card I hope not!! Thanks!! I love using stubhub! Everything works perfectly and efficiently! I accidentally hit a wrong button and bought tickets for another game that I could not go. I tried to exchange them right away but the tickets are not refundable or exchangeable. Another time is I tried to get a credit for a game I could not make because I was in the hospital for the day I was supposed to go. Lost $163. Stubhub does not offer insurance. It is buyer be aware. Also, they don’t tell you what seat number your ticket is. If you’re selling tickets that need to be transferred to a buyer you can’t confirm transfer of the tickets via the StubHub app. You have to do it via browser. Trying to list tix causes app to crash repeatedly. Useless. How is this app worth $30 in fees for two tickets? I've already exceeded $300 in fees over the course of two transactions. I'm not against paying for convenience and good service, but StubHub and TicketMaster come across more like loan sharking. Had problems using the app. Had to call customer service. It’s been 30 minutes and the money is gone out of my account but no tickets. I don’t actually want to give a 1. More realistic as a 3 as mobile tickets are much better than last year. However, it seems most companies only care to read the 1s so here’s to that so these might have a chance of being resolved. Issues: 1) I have direct deposit set up for payments on the website. I only have had PayPal as an option all season long on the app. Why?!?! 2) For the past couple weeks I got errors when trying to post. At the end it would just say “Something went wrong. Please try again.” No description as to why. Contacted support and their only remedy was to tell me to upload through the computer. Found out the real reason was because my CC on file expired last month. Please give descriptive error messages so people can know WHY something went wrong. 3) This was awhile ago but still pisses me off. Some jerk at StubHub kept emailing me saying my tickets were not valid and they would cancel my listing and charge me. I offered even to transfer and the douche kept saying if I don’t come through quickly I would be charged. This was with OVER A MONTH to go before the actual event. Kept saying StubHub would never accept screenshots despite my e-mails saying I’ve posted all mobile tickets this season that way with no problem. Finally I provided screenshots from the app which explicitly state to do this. No response. No apology. Just left me hanging to wonder whether or not it was actually resolved or I’d get a completely BS charge. Please inform your own staff on how the app works!! And apologize when a mistake is made! Your system did not tell me that there was a problem. I tried several times to purchase and it just said I had to add another card. It never stated the one on file had expired (because it’s not). I had a very difficult time trying to connect by phone. The tickets went from $90 each to $119. Not good for me. The fees are not broken down into the two ridiculous categories resulting in rounding miscalculations. You can’t delete credit cards without access to a desktop. Shame on StubHub & for me using it. Great app makes buying and selling easy to use love the map that shows the views of the seats from the stadium or arena you choose. Great competitive prices. Love the app. Scammed me out of selling tickets by moving the address several times after I had already ship them. Not to mention the service fee to sell... which I tried to cover by increasing the price of the ticket... it was capped so I couldn’t. Haven’t yet received a payment and have been on the phone with them for weeks. Don’t waste your time or money. The app crashes (version 7.9.2) when you add the second seat number in a sell situation. It was working fine just prior to this update. This is one of the least customer friendly companies I have ever dealt with. Everything is in small print. If you call them, it will take at least a half hour to get a person after listening to the same 5 word message over and over and over and over. They will apologize 5-10 times and do NOTHING. If you buy an e-gift card, they will do everything in their power to make it difficult to use. Bottoms line, go directly to the venue or one of their nicer competitors. You will be much happier. Was purchasing tickets through Stub hub... multiple times got to the last click to be told tickets were unavailable. Very frustrating. Front row to Joe Jackson 2019. Worth every penny! Why is it taking so long to get my tickets as also to get my money from the sell of my tickets ? Dissatisfied!!! Almost $100 for service fees is a SCAM!!!! I’ll never use this site again . $37 on $110 ticket...absurd, will look everywhere else 1st next time. This was amazing easy and quick to use! This site is so easy! Love the option to view the field before buying! Super easy and fast! Site is great but fees are a percentage. Why? The cost to transact doesn’t change based how much money the tickets are. Also, why can’t I update payment methods on mobile? I got tickets to a twentyonepilots concert for me and my boyfriend. I was so excited because it would be my first time on the floor at one of there concerts. We get there and one of the tickets worked. We got lucky that the person we went to let both of us in despite only one working. Best night of my life but not worth the panic attack of almost only one of us not being let in. I have used stub hub for many years and when I wanted to surprise my wife for a Christmas show I figured I would just get the tickets through them. I had purchased the VIP ticket option ( same as other websites) and when received the tickets were not VIP but “ general admission. Stub hub contacted the seller who assured them that they gave the right tickets. To make matters worse the VIP tickets don’t include the Meet and Greet session which is included on every other Websites VIP option. Stub hub did nothing to correct their falsely advertised listing and now I’m down $600 with not Christmas gift.... thanks Stub Hub! Use Ticketmaster! StubHub will bait and switch your tickets and not refund your money!! After you get your heart set on seats and tickets, they tack on ridiculous fees at check out. $100 tix $25 fee RIDICULOUS !!!!! I wasn’t expecting such expensive fees! It is frustrating in a long row of seats not to be able to have a seat number to determine which tickets are best. Please require input of seat numbers and show them on Stubhub! Some screens don’t have back button, so to go back a screen, I have to quit the app and restart the process. Kinda frustrating. Horrible experience just trying to buy tickets. Can I break down what my fees pay for? I’m sorry but what does stubhub do where they need to charge me $80 for two tickets? Bought some last minute tickets for an upcoming game with great affordable prices very very cheap compared to Ticketmaster and trust me this is not a paid AD lol I’m just really impressed. Ridiculous you can’t easily add tickets and parking pass into same shopping cart. Great way to get tickets! There’s no reason fo such high fees. You heart something or an event and when you log off and or close the app and restart all your favorites that you hearted are gone and reset back to unchecked. Please fix this. Don’t know who to email, forced to leave in the review. App works perfectly, selling tickets is easy and safe, I’d recommend that service to anybody. My only complaint is it can take 5 days for money to be deposited to your PayPal. There is absolutely no reason for them to hold your money for that long other than the fact that they’re reinvesting your money, and making more money off of your payout. Fncking cnnts and their ticket fees. Get bent, losers. Deleted this and will not reinstall. I downloaded for an event and turned on notifications for said event. I would view tickets and “add to cart”, ya know, to see final price since they hide their fees. Turns out adding to cart then going back turns on some “super spam notification” feature that is not easily disabled. If you like “only one more click to go!” push notifications of all kinds, this app is for you!!! It’s always a pleasure buying tickets from Stubhub. The App makes it very easy to find what you need. Tickets are able to be downloaded very quickly. I buy tons of tickets a year, New York, LA, Chicago, Denver and Minneapolis, and I almost always find what I’m looking for with Stubhub. Also, the personal customer service they give when you need to go beyond just doing it on the web. I’m bummed I can’t deal with just Stubhub versus AXS, Live Nation, Ticketmaster and Ticket fly. I would be ok if they controlled the ticket world because they understand the business they’re in. This new update is horrible. They got rid of the Value lines which tells you if the resales tickets are far more expensive or good. Now, I wouldn’t know the original price range so it’s going to be easier for the consumers to get ripped off. Very unhappy. Please bring it back the value sign!!!!!!!! Terrible and horrible. Avoid. Complete dishonest thieves! Stubhub is run by scammers. Ive tried to sell and buy tickets here, and each time, they stole from me and failed to do their job. When i tried to sell tickets, they either claim no one bought them and sold them (thereby stealing my ticket) or they sell them after i take the ticket down/use them myself and slap me a penalty fee for doing so. This company is super dishonest and their customer service, though responsive, is like a robot and doesnt understand that their business is unfair to the customers. When i tried buying tickets, they sold me ones that got me into the arena, but other people with the “same”tickets were sitting at my seat. And when i complained, they did nothing because they said the tickets they sold me were real. This company is built on bull$hit, lies and deceit. There is more trust in buying/selling tickets offline or other websites/apps. Stubhub is like the communist dictator that history hates and curses upon. So be warned, stubhub steals!!! How is it possible to charge this much per ticket for unexplainable fees?! Why do I have to call to get my tickets!!!! Stubhub is terrible. Twice I’ve had the app glitch up and thank me for purchasing tickets before I was done making my selection. The first time my tickets got sent to the wrong address, and the second time I got the wrong seats - and would have spent several hundred dollars more if the app wasn’t so glitchy. I called customer service both times, but they say their IT department doesn't see a problem. I won’t be risking that again. Also a big problem is you can’t see how much the fees will be til you’ve progressed to the buy now point. Deleting this one. Tonight was a crap shot... depending on platform, device and even if you are logged in to your account or not, you get different pricing on tickets and fees, very very confusing, especially for a long time customer. You’d think a long time customer would get the best pricing and fees, but that’s not that case, check with their chat advisors, not helpful or knowledgeable at all. Value - it would be great to understand what that means. When the bars are all blur or less than all??? Very confusing. They are my go-to for good seats, because you can always find them. But god forbid you have an issue as a Seller or Buyer. They’re awful. Didn’t mean to give them 5 stars. I lose so much selling tickets and have to pay more to buy them. You don’t even offer seat views. I have to go to seatgeek to get them. $40 fee per ticket? WT Holy F? Seriously? You’re now charging a 33% service fee. That’s criminal and honestly, this is the last time we do business together. I’d assume kiss Donald Trump first. High price for convenience. I miss the good old days when the general public could buy tickets direct. I don’t like the surprise fees before checkout! Price should be price upfront, I will continue to use but someone should look into an update. I feel the prices should be shown with the extra charge in it. Not wait until check out! Fees are >25% of ticket value. That just robbery. I’m a little confused as to why the service fee kept rising… I got kicked off the site came back in and the service fee was up $10 then it was the minute before… Unreal. There goes $20 I’ll never get back again… Thanks StubHub... you really know how to push away your customers. Never using StubHub again. I posted my tickets on StubHub months before the event. I was luckily able to have someone buy them just 3 hours before the show! Stubhub paid 3 days later. Easy to sell. Easy to buy from. 100% will continue using this app. Stubhub please add a back button. Had to closed app 5 times as I searched for tickets! Back out to previous screens is a nightmare! The fees are crazy high! In the middle of checking out the app changed prices and checked me out for $100+ more than intended!!! MAKE SURE YOU DOUBLE CHECK DATES I was booking my ticket (from the website) and I selected the date I wanted ... come to find out something was switched around and without noticing I booked for the wrong date. And now I’m here at the door trying to get in and no one can help.. I mean it was a mistake u can charge me a fee and get me a new one but no you get a 20 dollar discount on a 130 dollar ticket when I already paid 80 for it.. I’m not impressed and I have a feeling any other ticket agency would have worked out a better scenario! Easy, trustworthy, and provides a good product. Drawback is prices. Need a value based auction for last minute tickets. If I could give a no star review, I would. Entered the security code for the credit card dozens of times yet it still asked for it repeatedly. Lost my business. 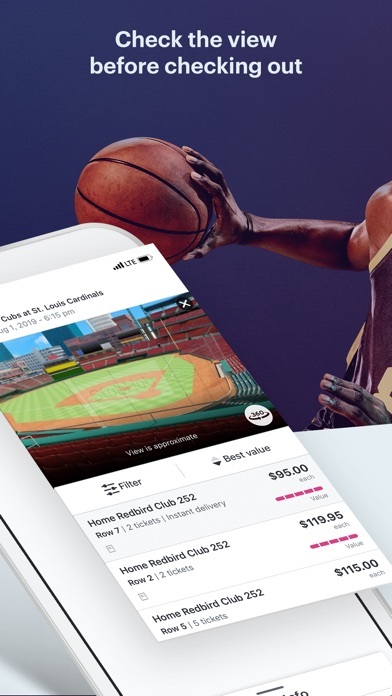 Go to Seatgeek. That app actually worked for me. This review is really a 1 star (the lowest available). The site would not take my nickname when attached to a 1 star review. Their system continues not to work well with Apple mobile devices. It should as they are among the most used in the world. To list a parking pass you must give a row and space number even when none exist. This, too, is a problem that has existed without solution for years. Always found tickets last minute to almost anything. I have had multiple issues with this company over the years and finally decide to write a review. The first issue that has been documented a few times over the last year is that the mobile app improperly displays QR codes. When I say improperly displays QR codes, it only shows half the code with no option to add to apple wallet or make the whole code visible. The second issue is that their customer service is almost non existent even after paying ridiculous fees for my tickets. The only way to get into contact with anybody is on their forums. There is no email or phone lines to submit problems to. Another issue I had with their forums was the response I received from one of the Moderators was to attempt something that doesn’t work on a mobile device. When I explained my discontent with the in ability to use the app in the most respectful way possible, my thread post was deleted within a few minutes with no further replies. If you do not believe check online and see their reviews and rating with places like the BBB. Finally, I will be furthering my complaint with the BBB and further only use Ticketmaster for my ticketing needs. I’ll never get my childhood back. My father used to drink and, for fun, have his way with my mother. It was brutal to watch. Anyway, I love this app. Purchased expensive tickets and wasn’t able to make the concert. So I tried to sell them, very difficult to do. The navigation through stubhub website was near impossible, didn’t work on my iPad worked on my desktop kinda. Then stubhub ends my sell listing early so I realist them they end them early again. There’s no way stubhub was going to let these tickets sell. Not to mention they nickel and dime you through the whole buying and selling process. Stay away, deal with the box office of the venue. THIRTY PERCENT SERVICE CHARGE ON AMY SCHUMER TICKETS!!! Unbelievable. Fees are extremely high. Only a good option for last minute purchases. With that said, sometimes you’ve got to just do it. They win because they’re taking money from you and we win because we get to go to a show. I had a great price for seats but when I went to checkout, they were gone. This happened several times, making me pay about $20 more than I initially anticipated. Very disappointed. I’m a loyal StubHub return customer who buys tickets for shows and sporting events regularly using the phone app. Today, after fighting with the app for almost 3 hours trying to purchase game day tickets and trying every payment method I had, as the app said there was an issue with my payment method, I called customer service and learned that the true issue was a site problem on their end. After all of that hassle they refused to do anything in the way of discounting or waiving the convenience fees for the online purchase, even though the purchase couldn’t be made online and it was far from convenient. Very Disappointed. This may be one of the greatest mobile apps ever developed by a large company. Their iOS dev team should be commended. Bought ticket on this app, and it says time TBD, and then after I got the email it shows it is in the afternoon on Wed and I cannot make it. That’s only after 5mins and I have them a call to cancel and change for another time at night. They told me the only way is to relist on their website and they would also charge me for relisting. Such a ridiculous website. Great service but the fees charged are insane. Both buyer and seller oy. Sometimes stubhub makes more than the teams or artists. Stubhub’s customer service is truly one of the most incompetent, unfriendly, and overall pathetic excuse of so called “assistance” I’ve ever witnessed. We only use Stub Hub! Go Dawgs. Love this company! Marissa M. was super helpful when I needed assistance. Will absolutely be using StubHub again. The safest best way to buy and sell. I have sold thousands of dollars worth of tickets on Stubhub and the process has been simple , effective and improved as time goes by. Love the site. Ps I be purchased quite a few with the same results. Stubhub used to be great with fees but now it gets very excessive! Why are the fees so crazy high, even on low priced tickets. Seems ridiculous. Tickets were $200, and stubhub wants an additional $75 for EACH TICKET in fees. Stubhub, your juat another greedy ticket company that wont get my money, ever. Found tickets for a Portland trailblazers game and a Oregon ducks game at a reasonable price. I signed in as a guest to look at tix. When ready to buy I tried to login to “my account” since I had a password but I could not. I tried to reset my password but never received the link. I read the FAQ’s and cleared my browser’s cache & cookies. I still could not reset my password. A pop up stated there was a problem & to try again. I did repeatedly. When I called this morning I learned that you can’t reset your password on a mobile device. Why wasn’t there a notice regarding this when you try to reset it? Furthermore, why wasn’t there one under FAQ’s? Making matters worse, I received a “Thanks for joining!” email with a 10% off code. This too leading me to think I had established “my account” and could log into it versus just a one time use guest account. That was not the case and more importantly I was unable to use the code along with the gift cards I had thereby forfeiting a $32 discount. If this is going to be the policy, a bad one for the consumer, then there should be an explicit statement that discount codes and Gift Cards cannot be combined. A mere mention that it “can’t combine with other offers” does not lead one to infer that a discount code and a gift card type of payment cannot be used together. And the notice ‘Not valid on previous purchases or gift cards” indicates only that you cannot use the discount code to purchase gift cards. This entire experience has been very frustrating and Stub Hub is not consumer friendly. I purchased tickets to see my favorite band on November 2. The purchase went through and I received an order confirmation stating that the tickets would be emailed to me on November 9 with the show being on November 10. I did not receive an email and when I called to find out where the tickets were, I was told that they did not have the tickets for me and their only option was to issue a refund. I do not understand how they can sell someone tickets but proceed to not have the tickets that were bought. I do not recommend using this app unless you want to be told that you are unable to go to the event on the day of. Extremely dissatisfied. Will not use again. I bought a chair and they just sent me a ticket?? Easy to set and easy to use the app! Going to Opening Day NYM! Probably the most expensive and interesting game of the season and got a great deal the site says. Do not ever use Stubhub!! So tonight when we got to the concert my tickets did not work. Thankfully it was not sold out and we were able to buy more. My tickets that I got from Stubhub were not legit!!! Thankfully I am getting a full refund. If it had been sold out and my niece had not gotten to see this concert they would have gotten a worse piece of my mind than I did give them. Oh and a guy in line next to us at the ticket booth buying other tickets had the same issue from his Stubhub tickets. Again do not use Stubhub!!! They are nothing but a fraud. It’s not letting me buy tickets! It keeps saying, “There’s a problem with your request, please try again later!” Meanwhile, ticket sales are going up while this incompetent app struggles to get it together. Worked well in the past, but not now. Once Stubhub adds text alerts when you make a sell, I’ll give 5 stars. That is a feature that seems like a no-brainer to me! Stupid that you can’t change your address Over your mobile app, people do move you know! Stop asking me to rate your app in-app, if I did t like it, I wouldn’t use it! What’s with the $20 fee for an e-ticket. Ridiculous. Robbery. The surcharge for tickets is unreal.. two tickets for my event charged 47.50 in fees.. that’s highway robbery. Once you pay them good luck on getting your tickets and if you think you are getting your money back. HaHaHaHa! Price kept changing really quickly. Seemed deceiving. I did not receive my tickets from a seller and Stub Hub was very great at offering me a refund and choosing different seats available. Bought tickets by mistake and immediately tried to work around it. They told me to resell, which I agreed. They charged me 33% buyer fee which is ridiculous, but they wouldn’t refund that. Total scam and no empathy for their customers. Had been a loyal customer for years and never using again. Please show row and seat #s in the seat map. Each time a section is selected the visual jumps to a random spot. Do any of your developers use or test the app? You didn’t have completely unreasonable fees attached to the ticket price.